If you are planning to go on a holiday or business trip in the United Kingdom, then booking a car hire at VroomVroomVroom can make your trip memorable. You can conveniently go from one place to another at your own pace. Our website compares hire cars so you can easily find a vehicle that will best suit your budget and needs. Enjoy great rates: We have partnered with the country's leading car rental companies so we can provide you with the best rates. Read our Price Promise for more details. Wide selection of cars: Enjoy car hire shopping as we list down different types of vehicles - from economy cars and SUVs to luxury cars. Convenience: Since we compare rental cars from different companies, you can easily find the closest pick up and drop off locations. Trusted since 2001: We are the experts in rental cars so if you have any query or need help in booking a car hire just contact us. You can also get in touch with us via Facebook and Twitter. Is it your first time to use our car hire comparison website? We have created an instructional video to help you navigate our easy-to-use search engine. Some of you may be dreaming of going on road trip across the United Kingdom. You can now make that dream a reality by booking a campervan hire through VroomVroomVroom. 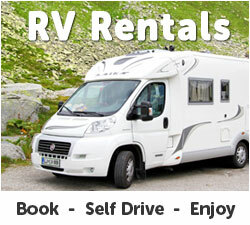 We also compare motorhome rentals from major brands. Click here to start finding your dream RV or camper.